This is the story of two remarkable – and extremely rare – wild white lion cubs on their journey to adulthood. 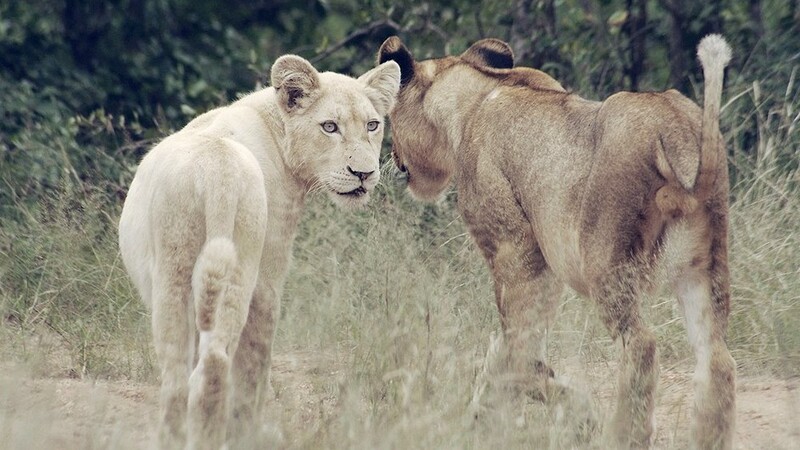 Both are female, sisters born as white as snow in May 2009 in South Africa’s Kruger Park. Growing up in this vast, wild wilderness they must not only overcome the same survival challenges that all young lion cubs face, they must also overcome the threats their high visibility brings. In the African bush anything unusual stands out strongly and is often eliminated by eagle-eyed predators. Will our cubs survive? The odds are stacked against them – 80% of all newborn lion cubs don’t make it to adulthood. The most important advantage they have is character. They are feisty. They fight for what they want – a very important quality for a lion, and especially for lion cubs which have a high mortality rate. They’re members of a small family pride, consisting of their tawny-coloured mother and her sister, who has two young tawny male cubs of her own. The two adult lionesses must protect their cubs well in order to raise them successfully through their critical first two years of life. The challenge facing the two mothers is enormous. Soon after their cubs’ birth, the father disappeared, possibly killed by rivals, leaving his pride to fend for themselves. The mothers fled their territory, to avoid any adult male lions that could take over and surely kill their cubs. So long as the lionesses have cubs they won’t come into estrous, but by killing the cubs the males will ensure the females are ready to mate sooner, and give birth to their own offspring. This film follows this lion family on their journey through the Kruger wilderness as they struggle to survive and avoid danger. Without a doubt the cubs’ highly visible white coats increases the risk. The last white lions cubs to be born here some years ago were killed by another lion pride before they reached six months. When you’re a white lion cub, hiding in the grass is impossible. To keep their pride alive our two lionesses must also teach their cubs how to hunt. This film follows their efforts, and show just how crucially important the parents skills and characters are in turning their helpless cubs into little hunters. Amazingly, these lionesses specialise in hunting Cape buffalo – one of the strongest and most combative of prey. This film features these hunts and shows our cubs getting first hand lessons in the skills of hunting. Despite our two mothers’ desperate attempts to keep their cubs safe it is only a matter of time before the rogue males track them down – leading to a fierce confrontation and surprising climax to our story. ‘White Lions – Born Wild’ is a true wildlife story, with strong characters and closely studied behaviour. We follow the cubs’ progress as they embark on the pathway to adulthood, learning to hunt, learning to avoid danger, learning to live in their white coats. This is a strong behaviour-led film, a coming of age story of a very rare and unusual pair of lions. Through their eyes we will learn what it’s really like to be a lion in Africa.